A research project of the Tlowitsis First Nation is helping determine whether the cold, pristine waters around North Vancouver Island will support commercial shellfish aquaculture. “We started out with scallops the size of a quarter and now they’re the size of a baseball,” says Gina Thomas, a researcher for the Tlowitsis Shellfish Aquaculture Pilot (TSAP) project. Three shellfish species seeded in the spring and summer of 2017 are on track to reach market size in what’s considered a commercially-viable timeframe of two years. “I’m very excited at what we’re seeing,” said Thomas, a member of the Tlowitsis Nation whose traditional territories include the waterway where the shellfish are now suspended, which is off the northeast coast of Vancouver Island. Positive research results may spur local commercial shellfish aquaculture in or near that site, and Thomas said she’d love if some of the area’s First Nations could seize that opportunity, and help increase local food production. Clam gardens kept by First Nations were once abundant in beaches around the region, but in more recent decades, attempts to farm commercial shellfish around North Vancouver Island have generally failed. 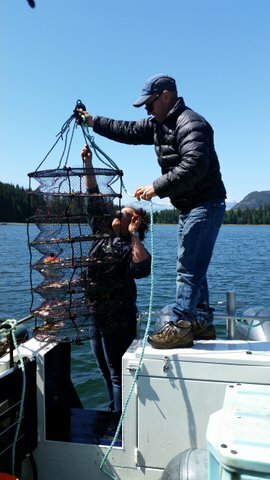 Thomas and another member of the Tlowitsis Guardian program, Brandon Wilson, worked with Tillapaugh to arrange hundreds of Pacific scallop, blue mussel, and Pacific oyster seeds in trays and nets and suspend them from a longline they secured between two buoys. Now, every two months, the three embark from Sayward, B.C. by boat to pull the shellfish up from the longline, count and measure them, and plot their growth on graphs. Despite barnacle growth on one cohort of one species, growth of all three species is consistent and they are healthy, having eaten ocean plankton. Shellfish predators like starfish and flatworms have not harmed them, Thomas noted, and fouling – a slimy coating that could impede growth and require manual removal – has been minimal. Whether the shellfish grow to market size is only one of many considerations. Further down the B.C. coast, where commercial shellfish aquaculture already flourishes, large-scale die offs have occurred, without explanation. Questions around transportation and labour availability in the relatively remote North Vancouver Island sites where shellfish might thrive are also of concern. Tillapaugh said the profit margin for most shellfish operations is slim. “It’s essential to future success of the shellfish industry to support research projects,” Tillapaugh said. The TSAP project also includes ongoing temperature and salinity measurements from underwater loggers that Tillapaugh, Thomas, and Wilson installed at three sites considered potentially viable for shellfish aquaculture. These measurements, which will be taken up until the end of the TSAP project in summer 2019, will provide additional insight into the suitability of Northern Vancouver Island’s waterways for shellfish aquaculture. Tillapaugh was part of a research team from Vancouver Island University that produced a report for The Marine Plan Partnership for the North Pacific Coast (MaPP) in 2016 evaluating the potential of shellfish aquaculture in North Vancouver Island. That report recommended a monitoring program in select areas. After consultations with MaPP partners, as well as a commitment to the project from the Tlowitsis First Nation, the TSAP project was devised. The cost of the two-year project is $68,000, which MaPP is funding. This entry was posted in North Vancouver Island. Bookmark the permalink.